Master class opportunities are usually plentiful and they can be useful on many levels, but coaching sessions with outstanding artists are indeed rare, especially those encouraging the inclusion of pianists who essentially play for their own pleasure. Andrei Gavrilov is a pianist of the highest calibre, with a once stratospheric career. This week he has been giving master classes to both amateur and young professional pianists in the West Country here in the UK. It’s hardly surprising that many of the classes were over-subscribed, but I attended one on Monday near Bath, featuring just four lucky participants who all benefitted from Andrei’s undivided attention. Monkton Combe School provided a fabulous backdrop for this event. The stunningly beautiful wood panelled concert hall, is complete with Steinway Model B and perfect acoustics. Since winning the International Tchaikovsky Competition in 1974, Andrei has enjoyed an outstanding career; performing around the world with major conductors and orchestras. He has taken several sabbaticals from the concert platform, returning more recently with renewed vigour, energy and particularly, sharing his love of music, which was evident right from the start of this class. The first young pianist, a student at the school, presented Chopin’s Nocturne No. 20 in C sharp minor (Op.Posth.). Andrei has recently recorded the complete Chopin Nocturnes (his first recording for many years) and offered copious demonstrations, whilst seated at a second piano. The young pianist gave a competent, musical account, but under Gavrilov’s tutelage, many aspects of her performance changed instantaneously; a credit to her flexibility and perception, as well as Andrei’s expert guidance. The importance of sound quality, varying dynamic shades and rhythmic stability were discussed at length. The right hand scalic passages, which close this work, improved dramatically, and were eventually executed with gossamer-like conviction. Scriabin’s Poème Op. 69 No. 2 was played enthusiastically by the second young pianist. For me, this was possibly the most interesting part of the afternoon. Not perhaps from a performance view-point, but rather from Andrei’s ideas about this great composer’s music. Scriabin, whose often complex style exudes exotic mysticism, was glimpsed in all its glory, though the eyes of a fellow Russian. This quirky, capricious piece was suddenly brought to life through explanations of Scriabin’s fascination with Mysticism, Theosophy and the ‘mystic’ chord. The young performer’s sound (a crucial component in this miniature) changed markedly as she was exposed to Andrei’s descriptions and illustrations at the piano. The final participants were both music conservatoire students. The first presented the last movement of Beethoven’s ever popular Pathétique Sonata (No 8 in C minor Op. 13). Andrei highlighted rhythmic precision and lightness of touch as priorities. He also stressed the importance of pedal control, and the significance of producing an orchestral sound. The master class ended with Schumann’s heroic Symphonic Etudes Op.13 and one of Rachmaninov’s impressive Etudes Tableaux Op. 39. Gavrilov’s views regarding colour, touch, melodic line in the Schumann, and technical fastidiousness in the Rachmaninov, were compelling, insisting the only way to approach the latter composer convincingly is to a acquire a total understanding of the Russian Orthodox faith. The high point undoubtedly came at the end of the class, when we were treated to a performance by the Maestro himself, consisting of Chopin’s C sharp minor Nocturne Op. Posth., swiftly followed by Prokofiev’s extraordinary Suggestion Diabolique Op. 4, ably illuminating the technique and musical prowess that have earned Gavrilov his reputation. Master classes are important for participants and observers because they proffer an excellent vehicle for sharing interpretations and ideas. You can view my interview with Andrei Gavrilov next week as part of the Classical Conversations Series here on this blog. 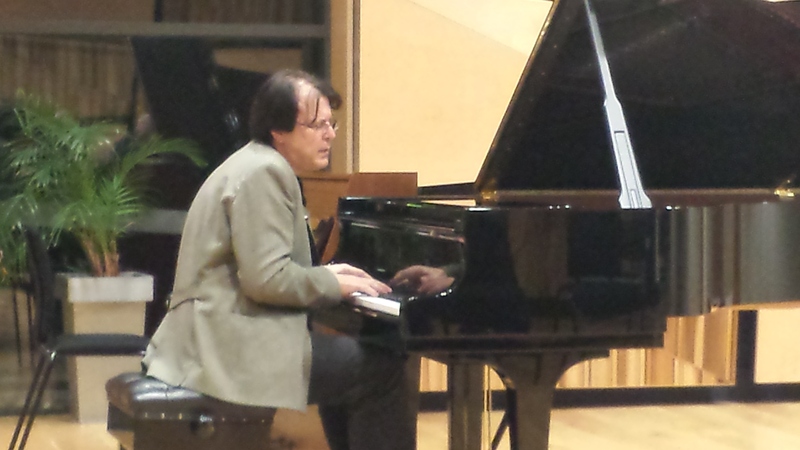 Image: Andrei Gavrilov performing at the end of his master class.